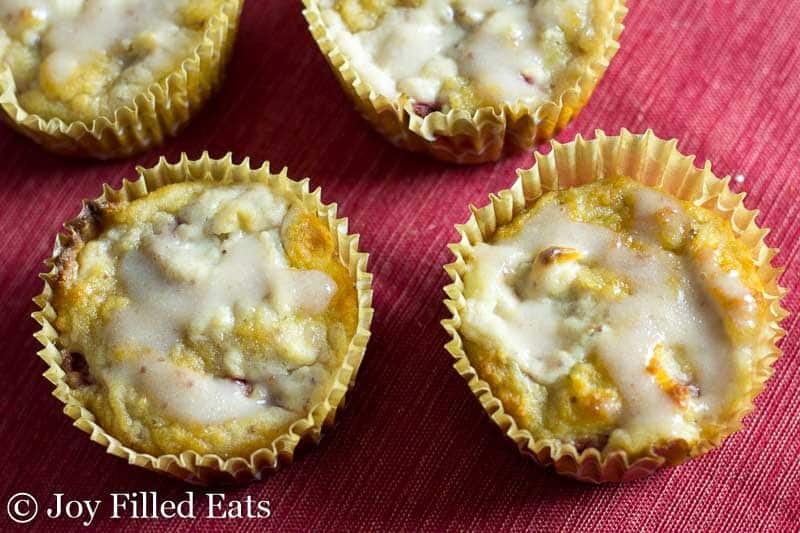 What could be better than beautiful little Strawberry Lemon Cake Bites with a Cheesecake Swirl? Not much. 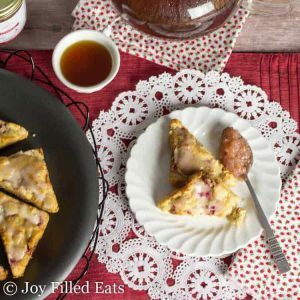 These are perfect for breakfast, an afternoon snack, or a tea party. I originally set out to make scones but these came out more cakey than sconey and they were so delicious I didn’t want to mess up the recipe tweaking it. I scored this cute Nordic Ware Mini Scone Pan for $3 at a rummage sale a few weeks ago. I’ve always wanted one so I was thrilled to get such a great deal. A local Visiting Nurses Association has a huge rummage sale (thousands of people and dozens of tents) in October and May and I try to go each time. Many of my blog props are from that kitchen tent. I love the feeling of finding little treasures amidst the chaos. I got nervous about the batter releasing from the pan and baked half in the scone pan and half in a cupcake tin. But I shouldn’t have. They popped out easily. This pan is amazing! Note: At this time Stevia Kitchens Jam is not available. I hope they do bring it back soon. In the meantime you can make your own Sugar-Free Strawberry Jam with my easy recipe. One the best new low carb and Trim Healthy Mama products on the market are the jams from Stevia Kitchens. They are sweetened with erythritol and organic stevia. They are low carb, low sugar, diabetic friendly, and Trim Healthy Mama friendly. This is a great small company to support. I’ve had the pleasure of sampling all three of Stevia Kitchens jams and enjoyed them all. I can’t decide if the strawberry or the blackberry is my favorite. I’ve never been a huge grape jelly fan (I was the rare kid that hated PB&J sandwiches) but theirs was delicious. You can see the grape jelly here slathered on my Sprouted Quinoa Bread. I spread a little extra jam on a strawberry lemon cake and then took a bite. And repeated. I had two of the cupcakes for breakfast and then ate the two triangles on the plate after the photo shoot. With no regrets. No scone pan? 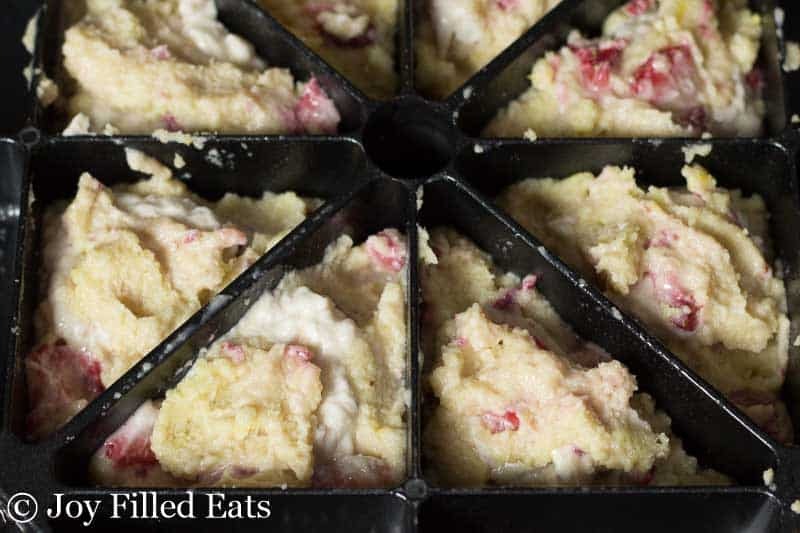 You can make these in any small cake pan such as a cupcake tin. 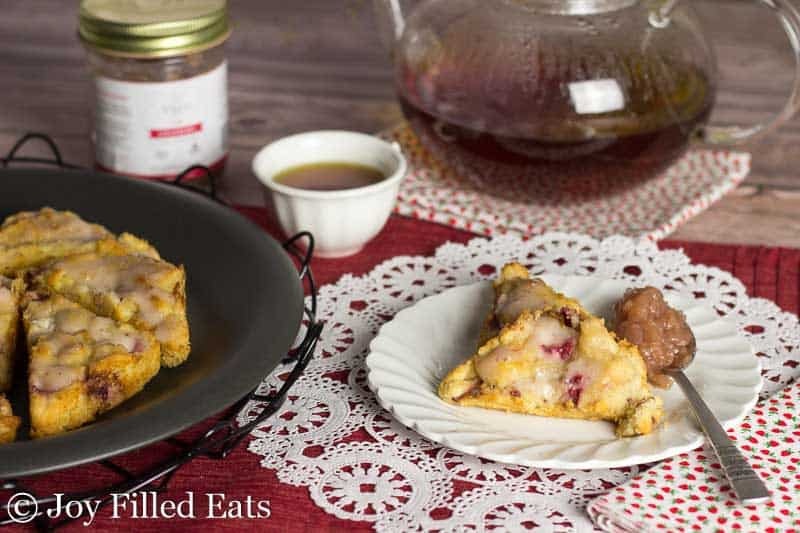 What could be better than beautiful little Strawberry Lemon Tea Cakes with a Cheesecake Swirl? Not much. 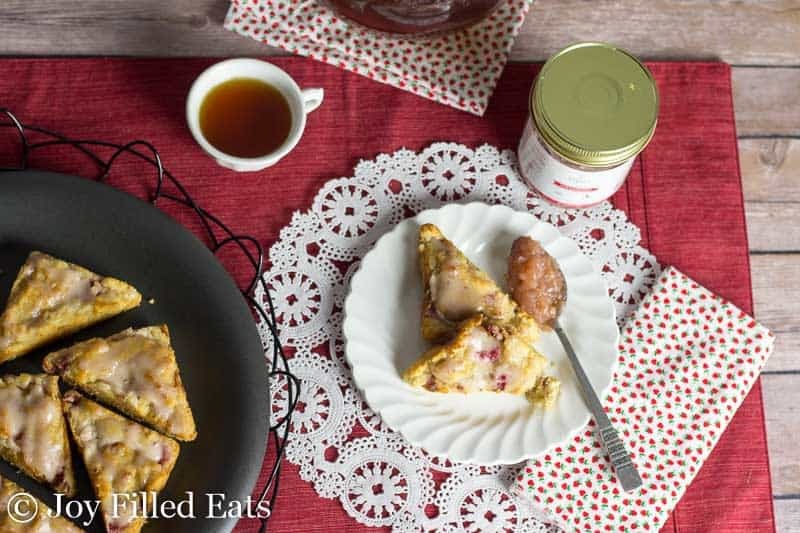 These are perfect for breakfast, an afternoon snack, or a tea party. Combine all the batter ingredients (except the berries) and mix until smooth. Gently fold in the strawberries. Set aside. In a small bowl combine the filling ingredients and mix until smooth. 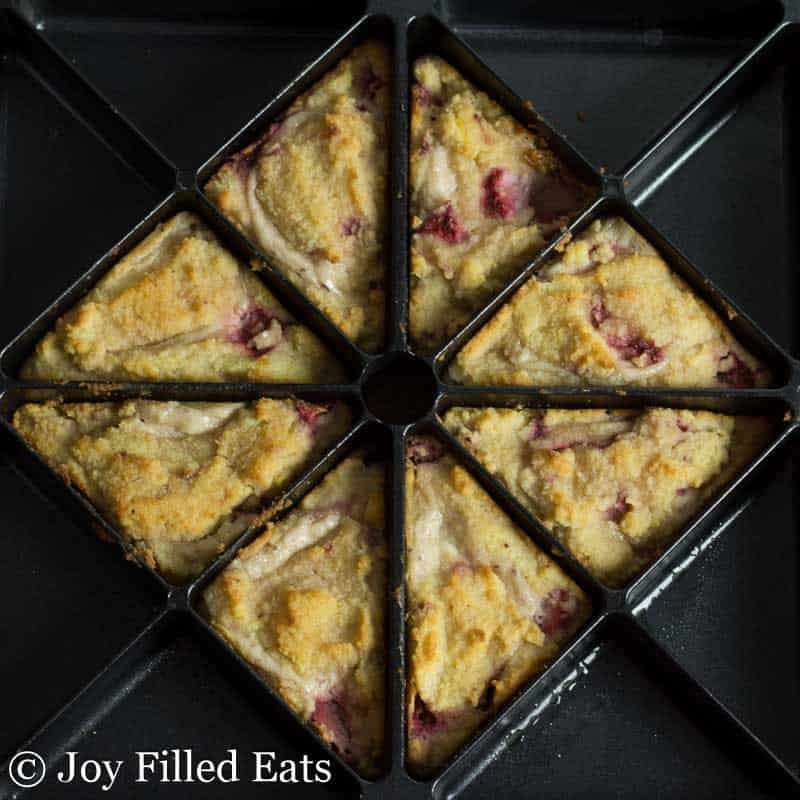 Put half the batter into a mini scone pan, cupcake tin, or other individual baking pan. Drop spoonfuls of the filling on top. Spoon on the rest of the batter. It's ok if some of the filling peeks through. Bake for 30-45 minutes or until golden. Combine the ingredients for the glaze and mix until smooth. I processed for a few seconds in my rocket blender. Spread the glaze on the warm tea cakes. Serve with additional Stevia Kitchens Strawberry Jam. Thank you for the recipe! I am going to Royal Wedding watch party tomorrow and needed to bring something I could eat. I didn’t have time to get Jam but I had tons of strawberries. I ended up sticking them in the food processor and doubled the amount of strawberries to a cup since omitting the jam. I also didn’t have the sweetener t called for so used Stevia blend. By pure accident I added 1/2 tsps instead of tbsp of the sweeter but after testing it, it was plenty sweet for me. Thanks again! The link to the jam doesn't work and a search of Amazon came up with nothing. Can I substitute Polanar instead? Yes. Hmmm... I wonder what happened. They are a small start up. Maybe they've decided to not sell via Amazon. Their website is still active. Yes, I just used one tablespoon of coconut flour however I thought the recipe said 11/2 cups of almond flour. Thanks. It is 1.5 cups. Sorry my error was in my comment. I just mixed up a batch of this batter to double check my measurements. It is a thick batter but shouldn't be dry or powdery. It worked fine for me again just now. I'm making these scones right now, but my batter is not a batter. It is just dry and powdery. I've double checked the recipe and I've not left anything out. Is there a missing wet ingredient? Thanks. Can you confirm you only used 1 tablespoon of coconut flour? I've had readers accidentally use 1 cup before. The ingredients are correct as listed. With only 1 1/2 cups of almond flour and 1 tbsp of coconut flour the liquid ingredients are sufficient. I've never tried those james - they look great - as do the tea cakes! Your tea cakes look just like the kind of thing I ought to be having with my tea right now. I wonder if you can get these jams in Europe as well? These look delicious! 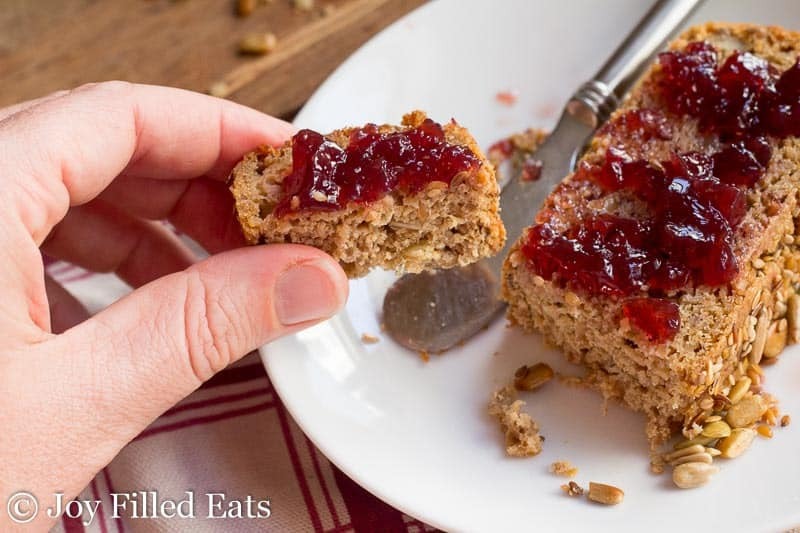 I've been wanting to try the Stevia Kitchen jams for a while now! I have pan envy! I think this recipes looked great in the traditional scone shape. I bet they were delicious. Thanks for telling me about the THM jam. I'm always looking for new jams and condiments. I love scones and these sound lovely. I definitely need that pan though!